Nokia does not cross a very pleasant time in the financial area, but about this in another post. This post is about another smartphone with Symbian (Anna version). The phone comes in a little blue box that reminds us of similar ones from HTC. The accessories are: microUSB charger, microUSB cable for PC connection – USB 2.0 and headphones with a 3.5 mm jack. Because of the stainless steel housing, this phone give you the impression of solidity, strength. The front side of this phone is black and each corner hide one speaker. It has a 4 inch screen with a classic resolution of 360×640 pixels. You can see decently in sunlight but do not expect miracles. On the upper side of the phone you will find the microUSB port, a 3.5 mm jack and the on / off button which also has the role in locking / unlocking the display. On the right side are placed the buttons for volume control and video camera. On the left side are placed the microSD slot and SIM card slot. We used over time. On the back side is placed an 8 megapixel camera sensor accompandied by a dual LED flash. The Nokia logo is centrally disposed. It brings a 680 MHz processor, 256 MB RAM, 1 GB ROM and microSD up to 32GB. 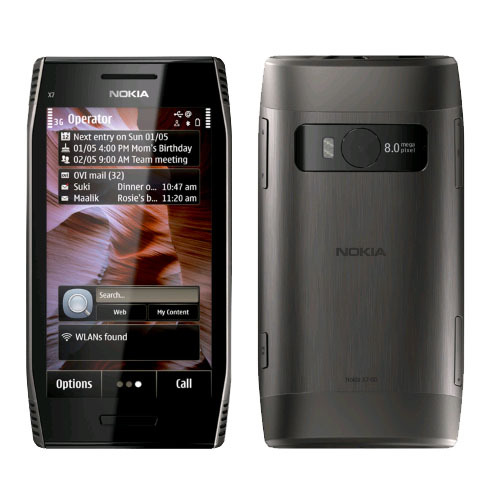 Nokia X7-00 comes from the very beginning with Symbian Anna, so you will not need to wait for the update appearance as those who are holders of Nokia N8, E7, C6-01, C7. You will notice large rounded icons in menu or application area, but deeper in the menu you will see that there are not to many changes.Into the Ovi store you will find over 50,000 applications, some of them being free. Complete package with 3G download speeds up to 10.2 Mbps, Wi-Fi standards b/g/n, Bluetooth 3.0, microUSB, 3.5 mm jack. Even if this is a phone that relies on entertainment, Nokia X7-00 doesn’t have a HDMI connector which could completed its connectivity package in a positive way. Nokia has put an 8 Megapixel fixed focused sensor that makes pretty decent pictures. The 4 inch screen and the multimedia features require their right which means that the 1,200 mAh battery consumes rapidly. At a moderate use, it will pass the threshold of 2 days, but if you hold on 3G, GPS or Wi-Fi in an intensively way, it will not pass 12 hours. This happens to all mobile phones with an operating system from the market.